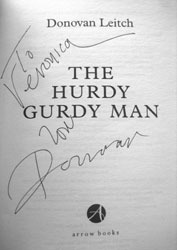 · The Hurdy Gurdy Man, Donovan's autobiography. · 10/07/2009, Cavan County Museum, Ballyjamesduff, Co. Cavan, Ireland. · Autographs session after the opening of the Sapphographs exhibition, Donovan Days.